Skoll Awardees ($1.25 Million Each!) Share Lessons On Life, Gender : Goats and Soda The winners of the 2018 Skoll Awards for Social Entrepreneurship share surprising lessons on life, leadership and gender in the workplace. 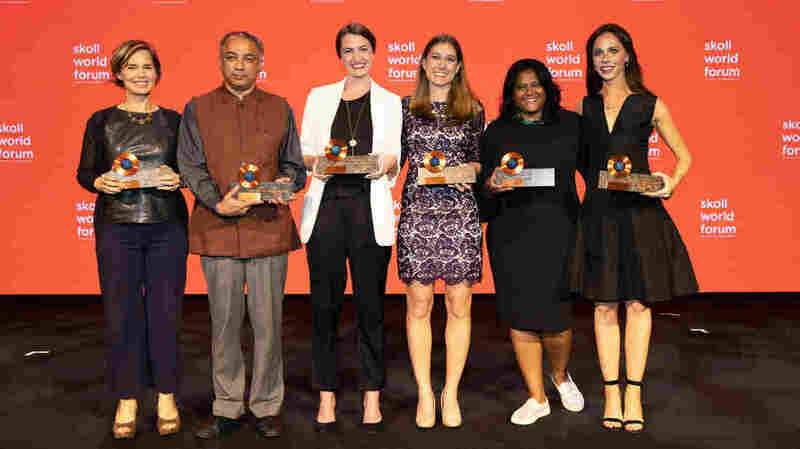 Winners of the 2018 Skoll Awards for Social Entrepreneurship (from left) are Jennifer Pahlka, Harish Hande, Jess Ladd, Lesley Marincola, Anushka Ratnayake and Barbara Pierce Bush. You can't help but note that of the six winners of the 2018 Skoll Awards for Social Entrepreneurship, five are women. "I'm the odd man out," jokes Harish Hande, an awardee for his SELCO Foundation, which works to provide solar power systems at low cost to the poor in India. The award is given to groups, either nonprofit or for-profit, dedicated to making the world a better place. And it is quite an award — a grant of $1.25 million over three years. The dominance of women this year was not just happenstance. Jude O'Reilly, senior director for social entrepreneurship for Skoll, puts the issue of awardee gender in context: "We are dedicated to building a more just and equitable world. This means being deliberate in sourcing a strong pipeline of woman entrepreneurs." Struck by the 2018 class of mainly women awardees, I wondered — do women bring special skills or sensibilities to the world of social entrepreneurship? I also wanted to find out what surprising lessons these award winners have learned in their work and what advice they have for other nonprofit leaders. Barbara Pierce Bush was honored for Global Health Corps, which she co-founded in 2009. The group selects young professionals with an interest in global health and sends them for a year to work at health organizations and government agencies in East and Southern Africa and the U.S. So far nearly 900 fellows have served. Bush said the lesson she learned was to be prepared — and to roll with it: "I wish I had known you can plan as much as you can, do all the homework, and you're more effective that way — but then real life happens." Bush is now the chair of the group's board. The new CEO is Daniela Terminel, who had this guidance for both women and men at the helm: "Lead with love. You can lead with fear or love. But lead with love." Then, she says, the people who work for you "can be the best version of themselves." Anushka Ratnayake laughed at the question about surprising lessons. "It's really hard," she says of the effort it took to launch her group, MyAgro, which lets African farmers save money via mobile banking to buy better seeds and tools. The group also helps them come up with smart strategies to increase their income. One of the best strategies she has learned is to go out in the field every week, "and I learn something new" — for example, how cashew farmers were selling their nuts to a middle man rather than taking them to market themselves, which meant a loss of potential income. So the next step, as Ratnayake observed, is to encourage them to band together and skip the middle man. "It is hard to raise funds"
Victoria Arch is the COO of Angaza, which created a pay-as-you-go system for the poor so they could afford solar and clean energy devices. What surprises her about her job? "This is so obvious — but how hard it is to raise funds," she says. And to explain that Angaza aims to make a profit but still needs to raise capital to fulfill its social mission. On the gender question, she thinks "women tend to be better network thinkers." They'll look at "different solutions" rather than fixate on just one, she says. Lesley Marincola, who founded Angaza, agrees that "women are more likely to think about partnership options." Jennifer Pahlka is the head of Code for America, which builds digital systems to help citizens cut through red tape that may make it hard to get help from government services. The lesson she has learned, she says, is "when you start out, it can be lonely. You need a network. A network is beautiful. You need support, you need emotional support during the tough times." It can be colleagues, other entrepreneurs, friends and family: "Nobody does this alone." But she doesn't think networking is a female skill. "[Women] bring a different set of experiences"
Jess Ladd's mission with Callisto is to offer options for women on college campuses to report sexual assault and harassment — and to provide the data to the institutions. Because, Ladd says, there can be a stigma associated with stepping forward, Callisto gives a woman the option of writing a time-stamped report to document an incident as she determines what steps she wants to take. Callisto also uses its data to identify assailants who have assaulted or harassed multiple women. What's surprised Ladd: technology alone can't solve a problem. "I got too excited about it," she says. She wanted to "scale it up too quickly." But she soon realized she had to learn what was working — and not working — by scaling back, interviewing students for their views on the system and doing in-person training rather than just providing a training video. To Ladd it is clear what a woman brings to this world of social action. "We live in a world designed for and by rich white men. That shows up in our laws and in so many aspects of our society. [Women] bring a different set of experiences," she says. "It's critical that social entrepreneurship has that diversity." "It's not about a solution"
The sole man in the group of 2018 honorees didn't shy away from the gender question. "Empathy is deeper in women," Hande of SELCO says. "It's very inclusive." As for men, he thinks, "they come up with a solution and try to find the problem to fit it." "It's not about a solution running after a problem," he says. "It's reasoning how a problem came to be, and you try to fix it." Readers, do you think men and women bring different skills, sensitivities and leadership qualities to organizations with a social justice mission? If so, give examples. Or is that question itself a way of gender stereotyping? Email your thoughts to goatsandsoda@npr.org with the subject line "Gender in the workplace" by Friday, April 20. We may publish excerpts in a possible future post.